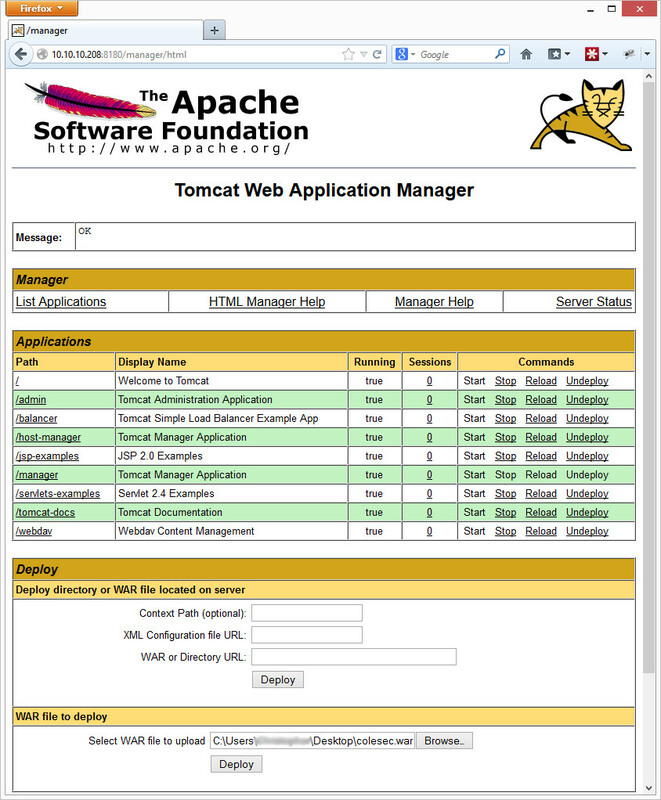 Apache Tomcat has a feature where you can upload a package. The package is a .war file that is essentially a Tomcat application. If you can get to the administration panel and upload a bad application, then you can get command line on the box. This attack is especially useful if you find a forgotten installation of Apache Tomcat that nobody bothered to take down. Often times the credentials are obvious, and you can use this attack to pivot further into a network. Most of the time, you’ll find Tomcat on port 8080 or sometimes just port 80. Metasploitable’s is on port 8180. If you are finding .jsp files, then there’s a good chance it is a Tomcat server. You can also try the /admin or /manager/html directories. 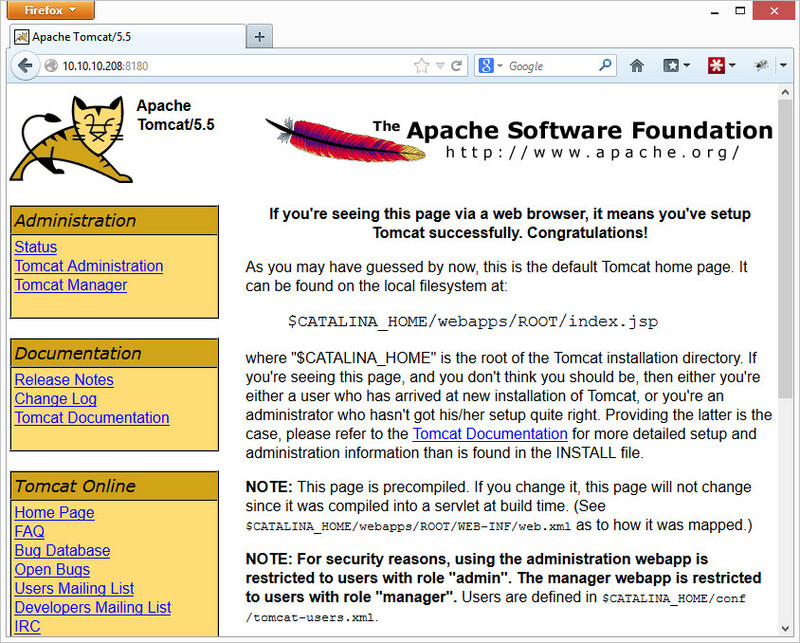 The error page or HTML headers returned by the web server will also often say if it is Apache Tomcat. Metasploit has a scanner under auxiliary/scanner/http/tomcat_mgr_login for default logins. The scanner is pretty useful because it also contains a wordlist of default usernames and passwords for Apache Tomcat installs. Tomcat doesn’t really have default usernames and passwords, but canned installs (such as xampp) do. You can also manually try to login under the same links listed above. Metasploitable 2 uses tomcat/tomcat. You may get the message “Exploit failed [no-target]: Unable to automatically select a target”. Metasploit can normally tell what kind of system it is attacking, but on this particular exploit it seems to have a hard time with it. A “show targets” will tell you what is available. For Metasploitable 2, running “set TARGET 1” for Java Universal seems to work. If you change it to anything else, you may need to change your payload to a compatible payload as well. Finally, access the backdoor file in the application you uploaded. Then simply go to your bad application (http://192.168.1.5:8180/colesec/), and your netcat listener should suddenly get a hit. As a note, if you chose another payload (such as linux/x86/shell_reverse_tcp), you may have to go to a specific .jsp file in your application. You can uncompress the .war file to figure out the random name of the .jsp file by uncompressing it with “jar -xvf colesec.war”. Congrats, you’re in! Now to improve stealthiness, you can “Undeploy” your colesec application on the Application Manager page, and you are done. This entry was posted in practical hacking and tagged metasploitable 2, tomcat on January 28, 2013 by admin.